JLR India has already been going strong as the company enumerated a cyst in its sales number by 32% for the 2012 calendar year. 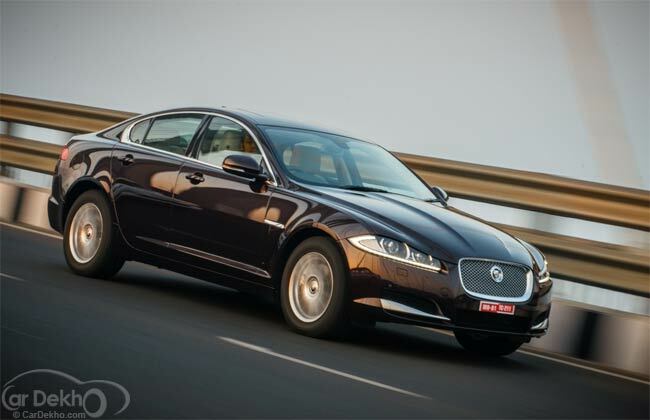 Now, the company will hit the jag-pot as it introduces the locally assembled version of the XF, especially with the introduction of the 2.2-litre engine— which will be the new entry-level version to procure the pouncing cat badge. Just within two days of the announcement, we get our hands on this locally compiled 2.2-litre XF that also gets the 2013 model year changes. Will this smaller engine also growl like the other bigger cats? Dig deeper, as the mystery unfolds. The design of the Jaguar XF remains unchanged on the 2013 model year. With the sharp features and details, the XF is one of the most gorgeous looking vehicles in its segment. The sharp headlamp design fuses well with the chrome front grille. One can easily relate the fascia with its elder sibling XJ L that looks more royal. The side profile does look sporty with the sloping roof design. Even the rear carries the same glam with the chrome strip and LED tail lamps. If you are impressed with exterior design of the XF, then there is still more to come your way. The XF doesn’t just pamper you with its luxurious interiors, but also makes you feel elite with its motoring theatre. You enjoy it when you step inside and push the start button. The air conditioning vents flip open as the gear knob rising into your palm. The 2013 model year XF gets standard features like satellite navigation, rear view camera, TV tuner, optimized audio and navigation controls, front passenger seat away, touch screen, gear shifting paddles, full size spare wheel, electric sunroof and rear screen electric blind. The number of added features list is huge and Jaguar hasn’t compromised on any of the luxury aspects. We are also happy for the fact that this vehicle doesn’t get a trim down version, just to boost its existing sales. Jaguar has retained its high customary standards even the 2.2-litre mill. The seats on the XF are comfortable, especially the front seats as they cocoon around you making it comfortable and non-tiring even on longer journeys. The rear seats are also cosy with decent thigh support, however the headroom in the second row is bit tight due to the sloping roof design at the rear. Even the boot is large enough to gorge luggage of four for a weekend trip. The 2.2-litre engine on the XF has already been seen on the Freelander 2 and the Evoque. This mill churns out 190bhp of power and 450Nm of peak torque. This is the third mill on the offering as it joins the 3.0-litre TDV6 and the 5.0-litre V8 supercharged engine options. The NVH levels of this engine are fairly low, and you do not encounter the regular diesel clatter melodrama like most of the other cars. Though there is a faint clutter noise on cold starts, but it settles in once the engine warms up. The power delivery is also fairly linear, and the engine has a strong mid-range when the turbo spools. The different sizes of turbos on the 3.0-litre helped to get a stronger low range in the XF but there isn’t much to be missed, considering the pricing of the 2.2 and one can happily live with this four pot mill as it comes mated to a eight-speed ZF self shifting transmission. This helps to spread the torque more evenly than the six-speed, enhancing the performance and also the fuel economy of the vehicle. The acceleration isn’t brutal, but it is adequate to make those quick overtaking manoeuvres in the city or the highway. The 2.2-litre has always been a frugal engine, however with the new eight-speed transmission, the engine spins at even a lower rpm in the top cog, when you cruise at 120-140km/hr on the highway. The shifts on the box are smooth but there is a prominent lag, especially when you plant your right foot. The ECU takes a while to engage the correct gear. Apart from this, we have no complaints about the powertrain. The driving dynamics of the 2.2-litre XF hasn’t changed much; in fact it has been enhanced. The ride on the 2.2-litre is more smooth and composed when compared to the XF S, as it has higher profile 17-inch tyres that absorb the bumps much better than the 18-inch. The ride suppleness on the XF S is good, but that on the 2.2 is excellent. The handling is also good; in fact it should be better when pushed to the limit on the track, as the four-cylinder oil burner is lighter than the V6. The steering wheel is also light and weighs up well as the vehicle gathers speed. The 2.2-litre engine might be small, but the power generated by this economical oil burner is adequate for city driving and also cruising on the highway. The real worry now is for the competition, as the reduction in price for the entry-level XF will mean stiffer competition. The 2.2-litre XF has the grace with the space and even the pace.